Disk I/O error. Right-click the Skype icon in the Windows taskbar at the bottom right of your screen and choose Quit. Then restart Skype. If you keep seeing this error, please contact Skype customer support. I did some reading on the web about this message and I found out that it occurs when we try to open two Skypes at the same time or even to open the same Skype account more than once at the same computer. It can happen in both cases. As you know, starting more than one Skype at the same time is pretty useful and it can be done in two ways. The first is to use the program called SkypeLauncher and the other way is described in the link in the previous sentence. If the error occurs while using Skype Launcher, make sure that you are using the most recent version or start using another method for opening 2 Skypes. If this is not the problem, quit Skype completely and restart your computer. This will end all Skype processes. If you still get the message the next step is to rename the folder with your Skype data. Quit Skype and open Windows Explorer or any folder, in the address bar write %appdata% and press Enter. Now rename the folder named Skype to SkypeOld. Sign-in with Skype and now everything should be fine. A new Skype folder will be created automatically and also your chat history and settings will be gone. The previous step almost always works but if the error still appears then try upgrading to the latest Skype version or if you are using it already, try an older one. My friend used my iPad to contact her friends on Skype, now I am unable to log in on Skype using my ipad. Hi. What error does it say? What is your operating system? I have tried the delete and rename folder options and it did not work. I have tried to uninstall and reinstall option – did not work. 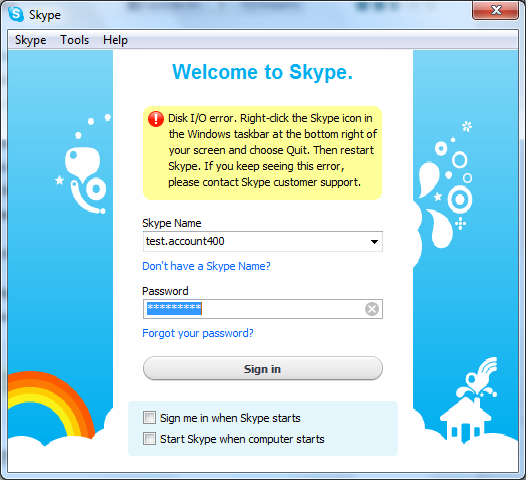 The same Skype login works on the same laptop on a different windows login. I have the latest Skype software. I am running windows 7. Hi. Quit Skype and try renaming the whole Skype folder in %appdata%. (It is like step 3 but one folder higher in the tree). New one will appear when you try to log in. Hi, I have tried what you suggested, and also done a clean reinstallation of Skype (latest version) as recommended by their helpdesk but I am still getting the disk I/O error when I try to sign in. I am using windows 7. This problem only started after I upgraded AVG to AVG 2014 (free version), is this connected? Quit Skype and rename the whole Skype folder located in %appdata%. Rename it to something else and open Skype. This will force it to create a new one. All chat history and settings will be lost though. Also run a scan for errors on the hard drive using Windows. Hi. Thanks for the info. I have changed the third solution to something more drastic, you can try that if you want. Also I added your solution to the last solution. my internet speed is 2mbps but still my connection on skype is problem.. what can i do..
Hi. This speed is not that good. And I assume it is maximum speed. Probably there are times that is several times lower. Try using Skype in a time when your internet is not overloaded. For example early in the morning. This is just to test if the problem is the speed. It might be another problem. By the way what is the problem exactly? Do you get an error or messages are delivering slowly?